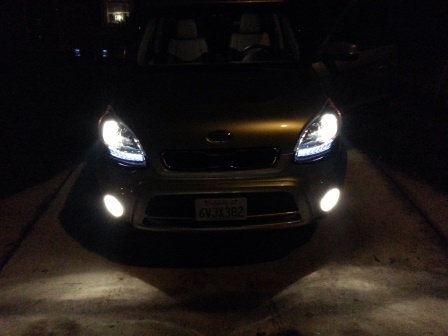 Clever Dude reviews the 2013 Kia Soul! First, I didn’t add the exclamation mark after the “Soul!” out of excitement, but rather because there are three models of the Kia Soul: Base, Soul+ and Soul!. I wasn’t sure if I was supposed to yell “SOUL!” every time I talked about it, but I found out the model name is “Exclaim”. I think my wife would have gotten pretty tired of all the yelling had I not found that out. And speaking of my wife, it was upon her insistence that I requested a one-week review of the 2013 Kia Soul, although being the type to like quirky cars, I was also keen to try one out. Some people call it a box. My mom calls it a mini-hearse (I still don’t see it). What do I think of the Kia Soul? I admit I didn’t understand the “box movement” when the first wave came out, and I figured it was just a ploy to get to the Millennial generation (I’m at the very tail-end of Gen-X). I never sat in one, just saw them rolling down the road full of hamsters in Adidas jumpsuits, and I assumed they were cheap boxes with some flashy parts to attract those with A.D.D. and a little money. Now that’s it’s been 5-6 years after their initial arrival in the States, and now on their 2nd or 3rd generations, the “box” manufacturers (Kia, Nissan and Toyota/Scion) have seen who is buying these cars and adjusted their marketing and packaging a bit. If you look at my current car stable, I have a 2006 Honda Ridgeline and a 2007 MINI Cooper S. Not your maintstream truck or car. So I like quirkiness. 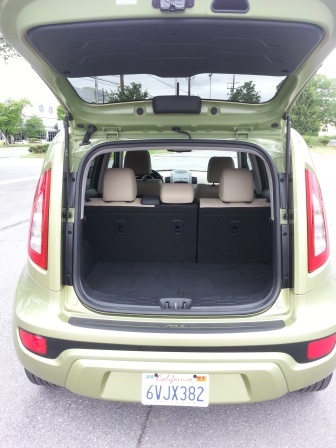 But the look from the outside of the Kia Soul isn’t what’s drawing shoppers’ interest in these boxy vehicles (see also Nissan Cube and Scion xB), it’s the overall value and packaging. Seats up. Still lots of space behind the 2nd row (compared to the tiny space in the Mazda Mazda5 microvan I reviewed last). Seats down and they lay flat for tons of cargo volume. The Scion xB has it beat, but read on for all the amenities this has too. And there’s even hidden under-floor storage, which was great for carrying some six-packs I didn’t want tipping over or sliding around. You see, Japan has been making these boxy vehicles to appeal to its youth, and it worked, so they brought the Scion xB and Nissan Cube over here. Kia added its Soul to the mix. But you know who are really buying these boxes? Well, anyone but Millennials I think! 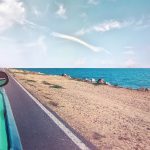 Given their inexpensive starting prices, roomy interiors, and relatively good fuel economy, the “boxes” appeal greatly to my generation and older who want features, safety, cargo capacity, and comfort, all at a low cost. And speaking of safety, this Soul gets 4-5 stars from the NHTSA all around, and has every safety acronym you can add to a car. Adjusted for my height, still lots of leg room in the back, and the upright seating means you’re not slouching. When I speak of “comfort”, I’m of course not comparing the Soul to a Lexus, but even though it didn’t have added lumbar support, after 260 miles of driving, including 5 hours round-trip from DC to Philly, neither I nor my wife complained about soreness or tiredness. In fact, I compare the driver’s position to driving my truck, in a good way. I sit upright, with good visibility all around rather than more reclined like in a sedan. And to add to the comfort conversation, the older population likes these boxes because they’re very easy to get in/out of because of the lower ground clearance and upright seating. 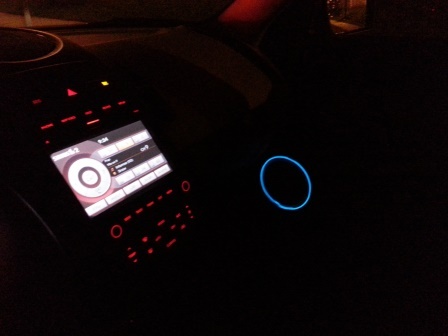 However, there’s still no upward adjustment option for the passenger, which seems to be missing in all of Kia’s cars, but visibility for my wife wasn’t a problem this time. Steering is very light and loose. Kia (and Hyundai) have been bashed for a long time for their light steering. Loose steering makes it harder to stay straight/in your lane on a road because the normal, small corrections you make to stay on course require more back and forth movement and attention. 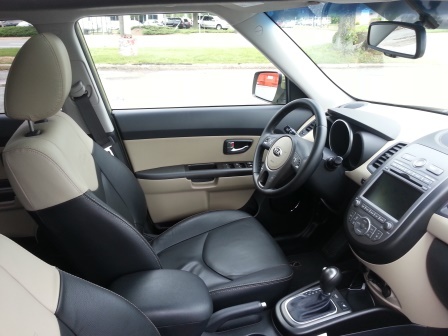 It wasn’t overly horrible in the Soul, and as I’m driving a 2014 Kia Sorento now to review soon, it’s not unique across even the newest Kia models. I’ll also complain here that the steering wheel is too slick/slippery. The specs say “leather wrapped steering wheel”, but it must be from a sea otter because only when my hands were sweaty and the wheel was baking in the sun for hours could I maintain a good grip. 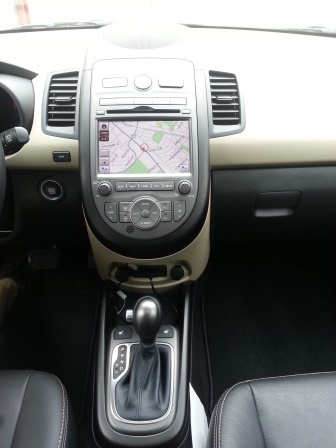 I’m finding this same problem in the 2014 Kia Sorento, but not in the other Kias I drove. NEED…GRIPPIER…STEERING…WHEEL! Suspension is stiff but compliant. The downside on the suspension is that it’s stiff, so when you hit a bump, you know it. However, the worst of it is when you hit a bump when turning or even changing lanes. You definitely notice the back-end jumping to the side. It’s unnerving at first to say the least, but you learn quickly and expect it to happen. I drive a truck, so bumps don’t affect me much, but I feel the same effect in the MINI Cooper and other small, lighter cars. But on the flip-side, I will say that the Soul is fun to drive, but more on that in a bit. The Soul! (2.0l engine) has just enough power. It’s more fun to drive a slow car fast than a fast car slow. For example, how much fun is it to drive a Lamborghini at 35mph? It’s made to go 200mph, so you’re not even stretching its legs. But drive a 2.0l 4-cylinder box 10mph over the speed limit, or hit some winding roads and you feel like you’re a race car driver. Not as much fun as the MINI, but I never felt any body roll, so it being taller doesn’t make a difference in the fun factor. And while I’ve read reviews where people complain the Soul is too weak (probably the 1.6l engine), I found it to accelerate perfectly fine around town and on the interstate, even in ECO-mode. The Soul’s brakes are excellent! I didn’t have any “panic stops”, but I found the brakes to be just right (not mushy and not too touchy). I actually stated out loud to my wife a few times that I really liked the brakes, which is a weird thing to like in a car. Ok, to summarize, the Soul!, with the 2.0l engine, is fun to drive as long as you know what to expect. New, elderly or distracted drivers need to be extra careful with the loose steering and stiff suspension combination. And as with any vehicle, we need to be aware if the car’s limits. Even though it feels like it can blast around corners, it doesn’t mean you should. Like all Kias, the Soul! 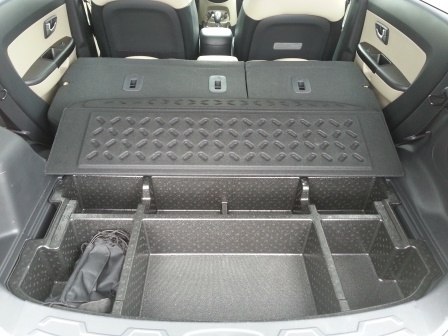 came packed with many goodies you don’t find standard and sometimes even optional in its class or even higher class vehicles. Things like heated seats, navigation, rear view camera, leather trim seats, auto-dimming rear view mirror, push button start with true keyless entry, tons of safety features, Bluetooth, sunroof, LED accent lights (below the headlights), fog lights, heated side mirrors with turn signal indicators, and tinted “privacy glass”…all covered for 5 years/60k miles bumper-to-bumper and roadside assistance, and 10/100k for the powertrain warranty. Whew! Throw in an Infinity audio system with satellite radio (oddly missing some stations like Octane, but maybe they cut down for the complimentary period), USB and Aux jacks, and a funky feature with colored LED surrounds on the front door speakers that can beat to the music or slowly change color, and you have a LOT of features. I will say, though, that this last feature (the rhythmic lights) was a bit of a distraction in my peripheral vision so I just left it on the “calming” mode. You can turn it completely off too. This was on a rotating color and blue came up. You can cycle through a bunch of colors for the rhythmic option. I chose the green that matched the car. 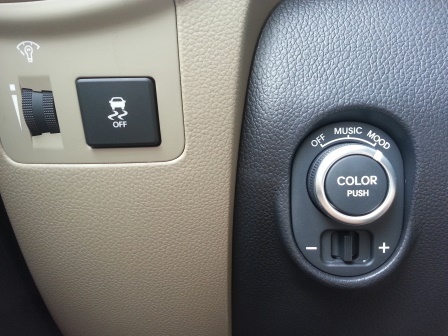 Button to control the speaker colors. The price for all this? Not much more than the loaded subcompact Kia Rio I tested last year. 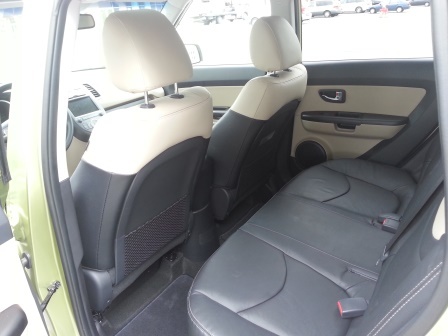 The base 2013 Kia Soul! model rings in at $19,900 plus freight. 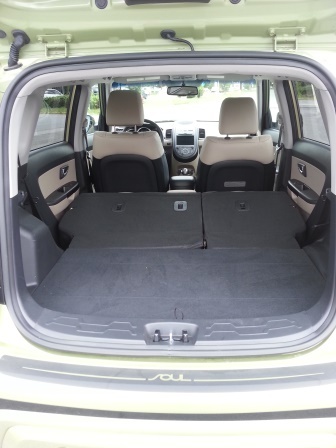 Add in the $2500 premium package for nav, push button start with smart key, auto-climate control and leather trimmed and heated seats, and then a $75 rear bumper protector, $50 cargo net (seriously? $50?) and the $275 electro-chromatic rearview mirror with compass and the final tally with freight is $23,575. For such a small, light car, with a small engine, you would think this would get really good gas mileage. Well, the window sticker says 26 city/34 highway with a combined 29 average. I only got, at best, 26.4 average on the 240 mile test. And I had it in ECO-mode the whole time. Granted, I tend to have a lead foot, but most of my driving was highway and I barely bested the city mileage? What gives? 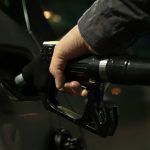 Oh, and at that MPG, with only a 12.7 gallon tank, you’ll be stopping for gas more often than you’d like. Well, the EPA adjusted Kia’s numbers a few months ago, so if you go to www.fueleconomy.gov (or Kia’s website), you’ll find the new numbers are 23 city/28 highway with a 25 average, so now my numbers make sense! But it’s a disappointing number for the size, weight and engine. Perhaps the boxiness accounts for some loss? Compared to the Nissan Cube and Scion xB, though, the Scion is 1 mpg lower average and the Nissan is 3 mpg higher average, so it’s comparable with its competitors. I really liked the Kia Soul!! (see, I added a !) I liked the color (kind of like fresh cut grass green mixed with emerald) as it stands out. While the interior had a lot of cheap plastics, it seemed well built and expected for this price range (and comparable to its competition from what I read). It had all the features I’ve gotten used to in the Kias I’ve tested, and if I didn’t have a truck, was on a budget and wanted something practical, it would be on my short list. The fuel economy bums me out, and I didn’t mention the driver window only has auto-down (why no auto-up Kia? Why? ), and the center stack needs to be tilted a little to the driver, but I can get over these issues for this price. With the Base model starting under $15,000 (before freight), you still get a lot of the features I mentioned here, but with a 1.6l engine and a stick shift (I wonder how that would be to drive). 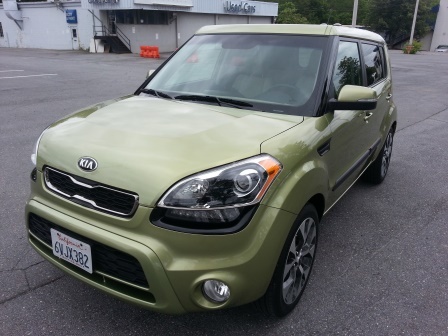 Do you have a Kia Soul, or another “box”? What do you think of them? Yea or Nay? Brought to you by Clever Dude. I received nothing more than the vehicle, a full tank of gas and insurance coverage by Kia to do this review.